Red Thread Adventures: Hey! Hey! Hey! It's Prudhoe Bay! The run out to the Arctic Ocean north of the Brooks Range is wilderness in the truest sense of the word. Trees pretty much give up just south of the Atigun Pass, which at 4,500’ isn’t all that high, but airplanes have trouble with the winds and road conditions still claim 10’s of lives each year. North of the pass you track down the Atigun River as the mountains quickly fade away and you’re left gently slipping onto a vast plain of tundra and, eventually, Arctic salt marsh. Low shrubs, wildflowers, mosses with shallow roots live above the permafrost that prevents deeper rooted plants from taking hold. This apparently barren landscape viewed from the relative comfort of the Dalton Highway, with its regular traffic and reassuring sense of civilization, allows you to see for hundreds of miles in either direction. The sheer vastness of the North Slope made me appreciate how completely unprepared we were for any significant change in the weather. It also reminded me of my first trip into the high desert east of the Oregon Cascades as a teenager. My mistake back then was thinking that there was nothing out there, but after a couple of days of bumping along the backroads I began to appreciate the subtlety of the countryside around me. The muted, shifting dun and ochre of the sands, the textures of golden grasses dancing in the wind, the songs of sage thrashers and crickets created an atmosphere as dense as any city street’s. It was a bit like thinking sushi doesn’t have much flavor compared to Cheeto’s. Deadhorse sits some 250 miles north of Coldfoot. Coldfoot is the last place you can buy gas. Verity, Sledge’s bike, with 6.3 gallons of fuel was at no risk of running out, and while I had spare gas to spare, I was determined to make it on my tiny five gallon tank. That meant taking it a little easier than normal and watching Sledge disappear into the distance while I eased Lily back and forth across her rev range. It was all downhill and we were going to give it a shot. When, damn!, the gas warning light came on a lot sooner than I'd hoped for. The fractioning towers of Prudhoe Bay grew taller and the low pre-fab buildings of Deadhorse finally emerged like zombies out of the ground. Crossing the town line I felt a sputter and ignored it - there was but a mere mile more to the gas station. Then I inexplicably stopped to take a photo and Lily expired with a cough. Pouring a little gas from the Rotopax proved much more irritating and time consuming than I expected. The idea is simple. Design a plastic gas can that secures with a firm twist of a huge knob to your motorcycle and off you go. Now you’d think that people designing devices that carry enough explosive energy to level a house wouldn’t develop a pour spout so fiendishly difficult to use that I nearly stabbed a hole in the side of the container to let the fuel out. But they did. Consider this a strongly worded letter of complaint. Besides, there should be a rule that designers (gits!) should actually use the things they create before marketing them. Lily’s center stand is another example of engineering incompetence and another story for another time. 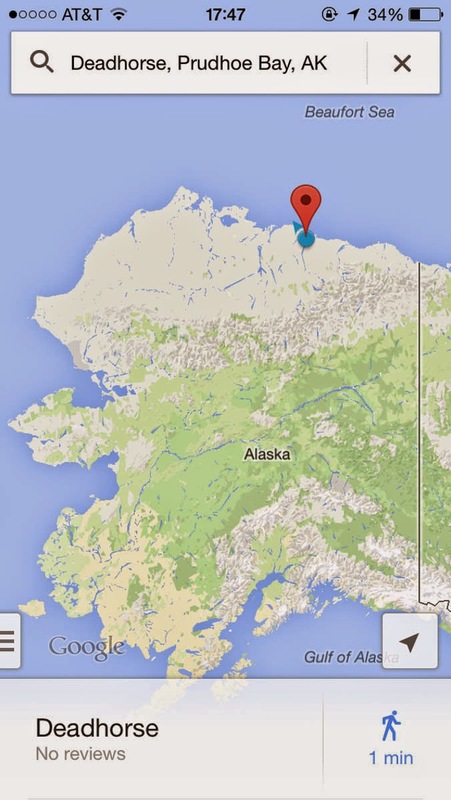 There’s only a few places to stay in Deadhorse and we ended up at the Prudhoe Bay Hotel for a king’s ransom. With long lines of dorm rooms stretching out at right angles from its main spine, the hotel's greenish fluorescent lighting made me feel like I was in a scene from Outland or Alien (before the monster strikes). As a drilling engineer, Sledge was both familiar and discomfited by the arrangements. Having recently left the oil fields of North Dakota, I think he found dropping straight back into a lifestyle he’d so recently left behind a little depressing. My notes describe a palpable tension like the skin on the meniscus of a water glass just before it overflows. Sounds a little sodding pretentious reading it now. 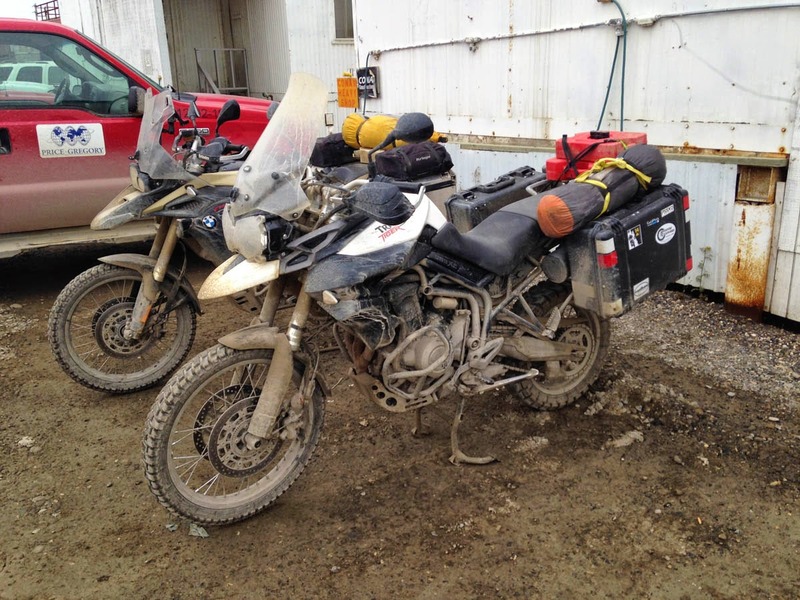 Our bikes were filthy, we were grubby and our gear was disgusting. The next hour was spent cleaning ourselves up and running laundry as we ate dinner and stocked up on tea bags. We wrote a few postcards to our families and friends and generally celebrated our arrival at the northernmost point either of us had been to in our lives as best we could in a dry town on the edge of the Arctic abyss. Temperatures dipped to just above freezing in the wee hours of the morning. It was time to turn and run from old man winter.